Frame Essentials ™ contains two types of glucosamine—glucosamine sulfate and glucosamine hydrochloride (HCL)—with methylsulfonylmethane (MSM) and boswellin extract. This unique formula provides you with an all-around product to maintain healthy joints and promote ease of movement. Both glucosamine sulfate and glucosamine HCL are forms of glucosamine. Glucosamine makes up 63 percent of glucosamine sulfate and 83 percent of glucosamine HCL. Most human studies have used glucosamine sulfate. This is because the company that paid for the research developed this form. Glucosamine HCL has not been evaluated as extensively, but clinical experience from a variety of health practitioners indicates that glucosamine HCL works just as well. Many health practitioners recommend trying one, and if that does not work, trying the other. AIMFrame Essentials™ gives you both of these at once. MSM is a biologically active form of the mineral sulfur. Sulfur is the fourth most plentiful mineral in the body and is found in every cell of the body. Sulfur plays a particularly important role in tissue structure. MSM is naturally present in foods and the human body. MSM has been used by veterinarians for more than 15 years, and use by humans goes back some 20 years. The formation of MSM begins when marine algae release sulfur compounds that are transformed in ocean water into a substance known as dimethyl sulfide (DMS). DMS rises into the atmosphere where it is transformed into DMSO (dimethyl sulfoxide) and MSM. These compounds are returned by rainwater to the earth, where they are absorbed by plants. MSM contributes to healthy joints because, as a form of sulfur, it adds to the benefits of glucosamine. It may aid glucosamine in its role in maintaining healthy cartilage as well as in helping to maintain joint flexibility and mobility. Many glucosamine users experience increased benefits when adding MSM to their supplement regimen. Boswellia serrata (Indian frankincense) has been used for centuries in the Indian Ayurvedic system of medicine to maintain healthy joints. This is still one of its main uses. Boswellic acids improve blood supply to the joints and maintain the integrity of blood vessels. At least one study has indicated that they may open up collateral blood circulation to provide adequate blood supply to the joints. Boswellic acids have been known to reduce joint swelling, maintain blood supply to inflamed joints, maintain mobility, and reduce pain due to stiffness in the joints. They also have no side effects. Shelf life is 2 years, sealed. Close tightly after opening and store in a cool, dry, dark place (70-75 �F; 20.1-23.8 �C). Do not refrigerate. May children and pregnant women take Frame Essentials  ? There should be no reason for children to be using this product. Pregnant women should consult with a health practitioner. 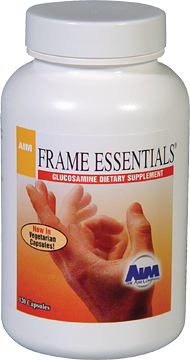 What is the source of the glucosamine in Frame Essentials ™? The source of the glucosamine is marine shellfish. May I take Frame Essentials ™ with other AIM products? Yes, you may. You may experience positive synergy between Frame Essentials™ and other AIM products. May I take Frame Essentials ™ with other medications? There are no indications that glucosamine interacts with other medications. Of course, you should always consult a health practitioner when adding new substances to your regimen. Yes, in one study on glucosamine sulfate in pill form, 90 percent of the glucosamine was absorbed. How does glucosamine compare to products such as Tylenol® and ibuprofen? There is no doubt that products such as these provide rapid relief. However, studies have shown that after four weeks of use, glucosamine is as effective or more effective than these products in providing relief from joint problems. Does Frame Essentials ™ have any side effects? Glucosamine is safe. A few people have reported stomach upset and nausea. In a year of formal testing of glucosamine, no significant side effects were found. Mindell, Earl. The MSM Miracle. New Canaan, CT: Keats Publishing, Inc., 1997.